The Wallabies have received a blow ahead of the 2011 World Cup with the news that back-row Richard Brown will miss the competition. The 23-cap versatile forward has been forced to undergo shoulder reconstruction and will sit out the next four months. With Wycliff Palu currently an injury doubt for the World Cup, Australia coach Robbie Deans will hope the rest of his back-row emerge from the current Tri-Nations competition injury free. Brown - who was omitted from Australia's 40-man Tri-Nations squad due to the injury - consulted the Wallabies and Western Force medical staff before making his final decision and was understandably disappointed to be missing out on rugby's showpiece tournament. ''It hasn't been good for a while," Brown told the Sydney Morning Herald. "I just wasn't playing as well as I could. I knew when I hurt myself last year it was going to be hard to make the World Cup. 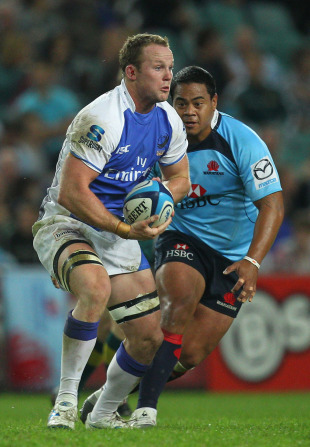 Meanwhile, Wallabies prop Benn Robinson will join up with the rest of the international side on Thursday. Considered one of rugby's premier loose-head props, Robinson tore the anterior cruciate ligament of his right knee before the season-opening loss to Samoa on July 17 and it was assumed he would be ruled out for the remainder of 2011. However, after learning surgery could be delayed until after the World Cup, Robinson will aim to prove his fitness to the Australia selectors while with the international side. If he passes this initial fitness test Robinson will be given every opportunity to make the 30-man squad, which is named on August 18. "The real test will be when I put some metres under my legs and push off the knee," Robinson told The Australian. "I'll do a bit of scrummaging as well. There are a few barriers in the way to get the all clear. This will be a very big hurdle for me. The challenge is there to have confidence in my running. "There is a small chance and I'm going to grab it . . . The World Cup only comes around every four years."